Disney’s Where’s My Water is probably one of the best puzzlers out there - we voted the game our favorite for last year, and now Disney comes with another title with a very similar idea, but this time using water in all of its forms. 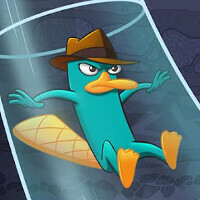 In the new Where’s My Perry for iPhone, iPad and Android Perry the Platypus from the ‘Phineas and Ferb’ animation series will turn water into steam and ice, and back and forth with various gadgets to solve the puzzles. The new title features over 80 levels, which is plenty of bang for the buck, but Disney promises more additions in the future. The game arrived late last week on iOS, but now it’s finally on Android as well and it costs $0.99. DOOBY DOOBY DOO WAH DOOBY DOOBY DOO WAH ...what?